A sample of bauxite, placed next to a penny. Bauxite is an important ore of aluminum, composed mainly of aluminum oxide and hydroxide minerals. It was named after the village Les Baux-de-Provence in southern France, where it was first discovered in 1821 by geologist Henri Rouvère. Bauxites have a range of commercial applications, such as for the production of aluminum metal and aluminum-based chemicals, abrasives, cements, and refractory materials. Bauxite showing a core of unweathered rock. Bauxite consists predominantly of minerals such as gibbsite (Al(OH)3), boehmite (AlO(OH)), and diaspore (AlO(OH)), as well as lesser amounts of clays (such as kaolinite), silt, and iron oxides and hydroxides. It may also contain small amounts of anatase (TiO2). Bauxite is a laterite, formed by the intense weathering of surface rocks. In the geosciences, lateritic bauxites (silicate bauxites) are distinguished from karst bauxites (carbonate bauxites). In Europe and Jamaica, carbonate bauxites have been found above carbonate rocks (limestone and dolomite), where they were formed by the weathering either of intercalated clays or of clayey dissolution residues of the limestone. 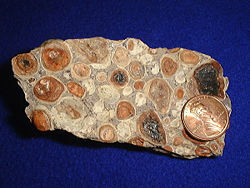 The lateritic (silicate) bauxites occur in many countries of the tropical belt. They were formed by lateritization of various aluminum silicate rocks, such as granites, gneisses, basalts, syenite, clays, and shales. Compared with iron-rich laterites, the formation of bauxites demands even stronger weathering conditions with a very good drainage. This enables dissolution of kaolinite and precipitation of gibbsite. Zones with highest aluminum content are frequently located below an iron-rich surface layer. The aluminum hydroxide in the lateritic bauxite deposits is almost exclusively gibbsite. The bulk of the world's bauxite production is processed into alumina (aluminum oxide) and then into aluminum. In the Bayer process, bauxites are heated in pressure vessels with sodium hydroxide solution at 150-200 °C. As a result, the aluminum in the ore is dissolved as aluminate, and the iron-rich residue (red mud) is separated by filtering. The liquor is then cooled, and pure gibbsite is precipitated by seeding with fine-grained aluminum hydroxide. 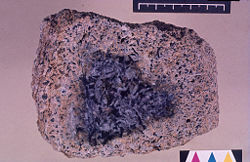 Gibbsite is converted into aluminum oxide by heating. This product is molten at approximately 1000 °C by adding cryolite (Na3AlF6) as a flux, and it is reduced to metallic aluminum by an electrolytic process called the Hall-Héroult process. ↑ A laterite is a surface formation in hot, wet tropical areas. The rock is enriched in iron and aluminum and develops by intensive, long-lasting weathering of the underlying parent rock. This page was last modified on 24 May 2016, at 16:35.